Contents. Note: Feature commands and/or functionality may vary dependent on the telephone equipment you choose to use with this product. Download "Contents. Note: Feature commands and/or functionality may vary dependent on the telephone equipment you choose to use with this product." 3 Contents Address Book 4 Anonymous Call Rejection 5 Call Block 5 Call Forward 6-7 Call Hold 7 Call Log 8 Call Return 8 Call Waiting 9 Caller ID 10 Outbound Caller ID Block 10 Outbound Caller ID Deactivation Per Call 11 Do Not Disturb 11 Find Me 12 Hunt Groups 12 Speed Dial Three-Way Calling 13 Voic 14 Voic to 15 Voic Message Waiting Indicator 15 Note: Feature commands and/or functionality may vary dependent on the telephone equipment you choose to use with this product. 10 Caller ID Identify your caller before picking up the telephone with Caller ID. Your phone must have name and number display compatibility for this feature to work 1. Wait two full rings when you receive an incoming call 2. Check the Caller ID reader for the name and number of the incoming call 2. Click Settings on the Features list 3. 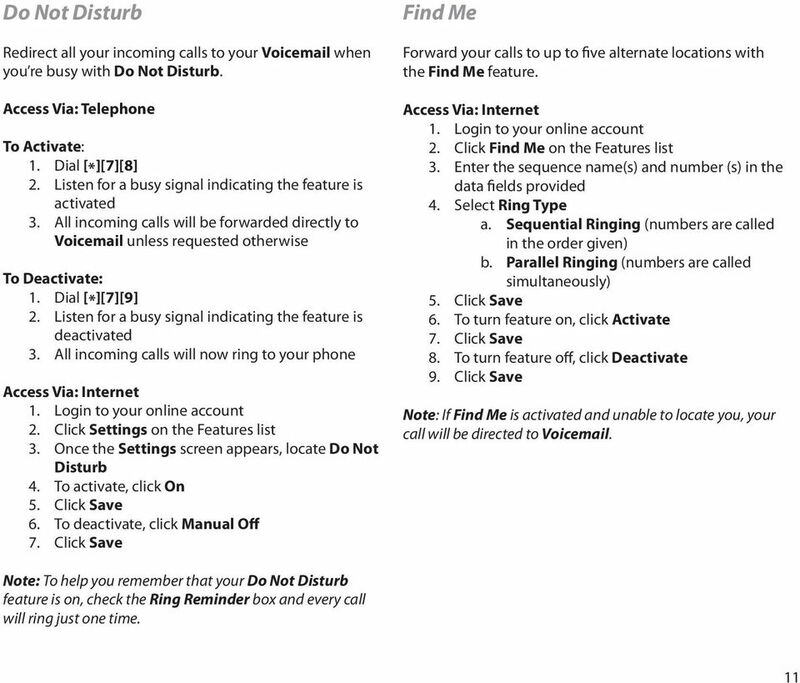 Once the Settings screen appears, locate Caller ID under Settings 4. To activate, click On 6. To deactivate, click Off 7. 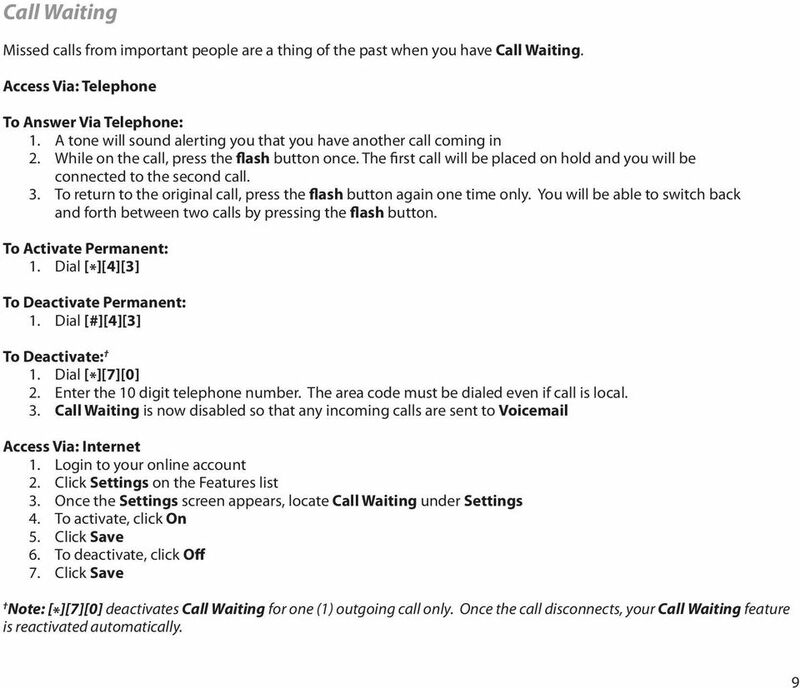 Click Save Note: The Off option deactivates Caller ID for incoming calls to your phone, not outgoing calls you make. 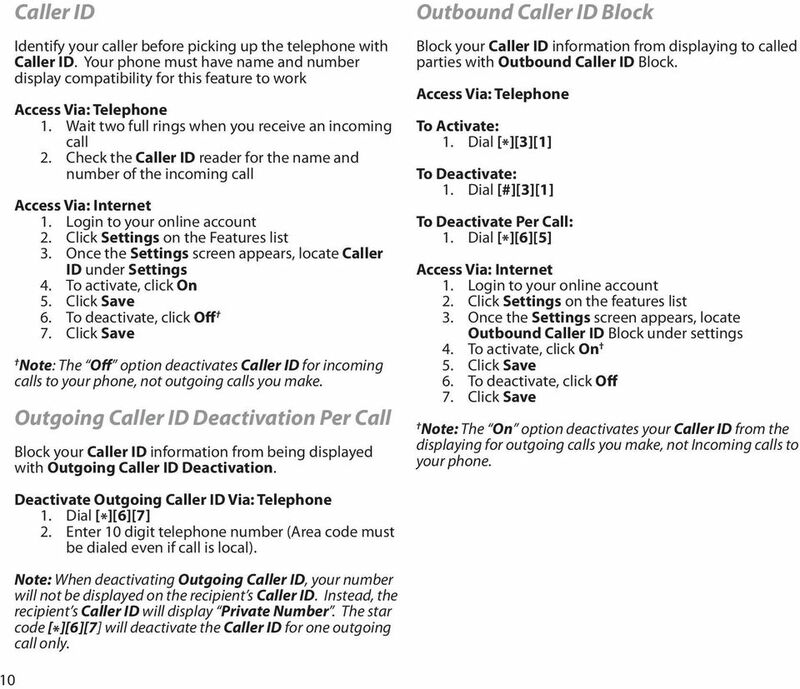 Outgoing Caller ID Deactivation Per Call Block your Caller ID information from being displayed with Outgoing Caller ID Deactivation. 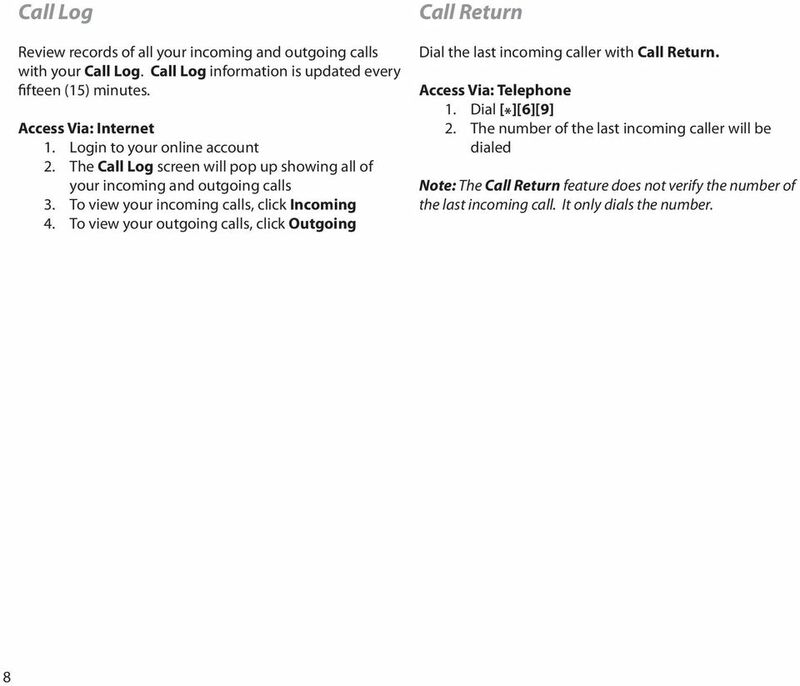 Outbound Caller ID Block Block your Caller ID information from displaying to called parties with Outbound Caller ID Block. To Activate: 1. Dial [*] To Deactivate: 1. Dial [#] To Deactivate Per Call: 1. Dial [*] 2. Click Settings on the features list 3. 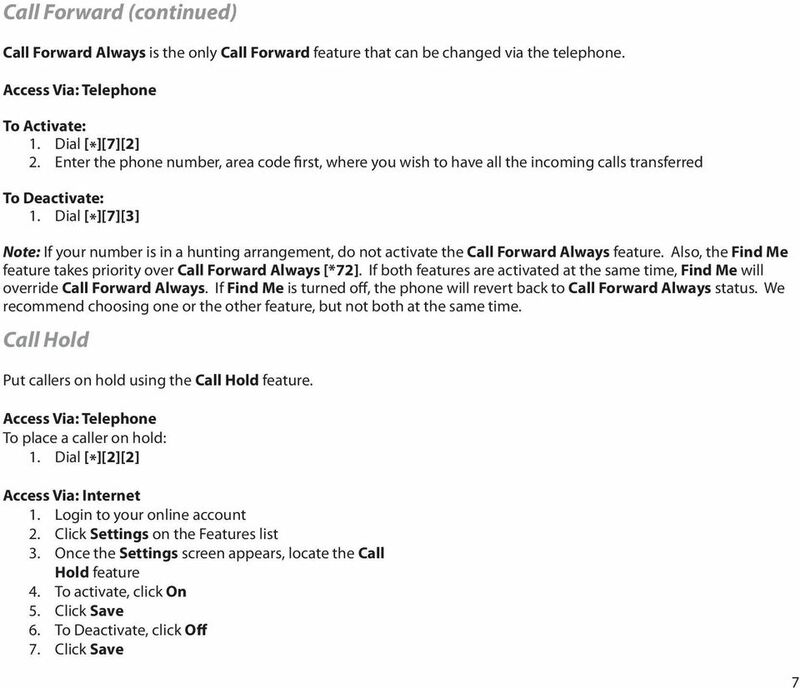 Once the Settings screen appears, locate Outbound Caller ID Block under settings 4. To activate, click On 6. To deactivate, click Off 7. 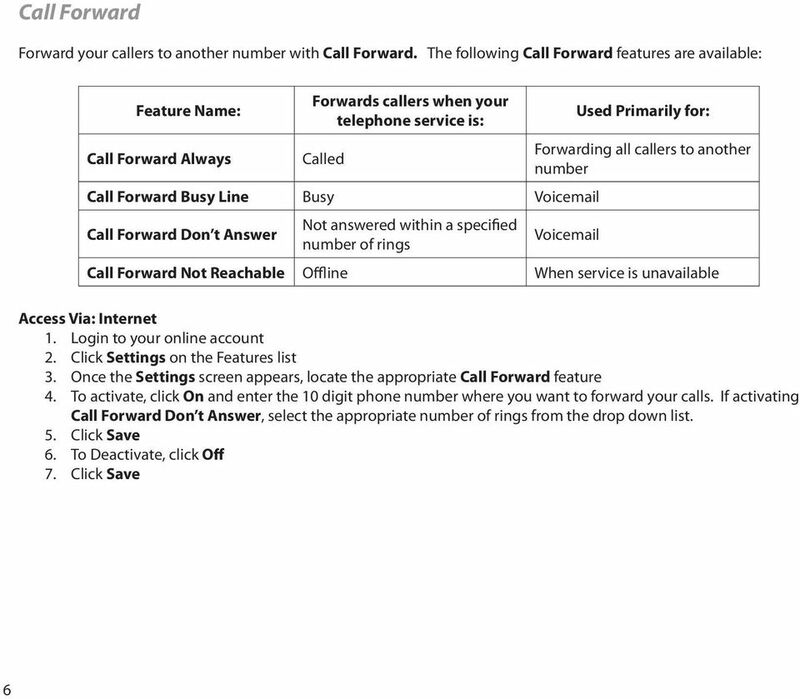 Click Save Note: The On option deactivates your Caller ID from the displaying for outgoing calls you make, not Incoming calls to your phone. 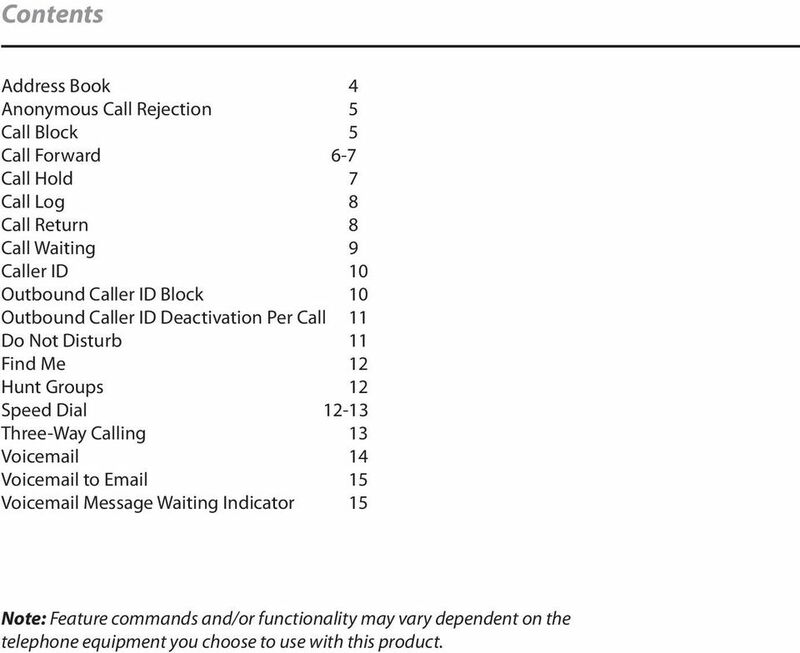 10 Deactivate Outgoing Caller ID Via: Telephone 1. Dial [*] 2. 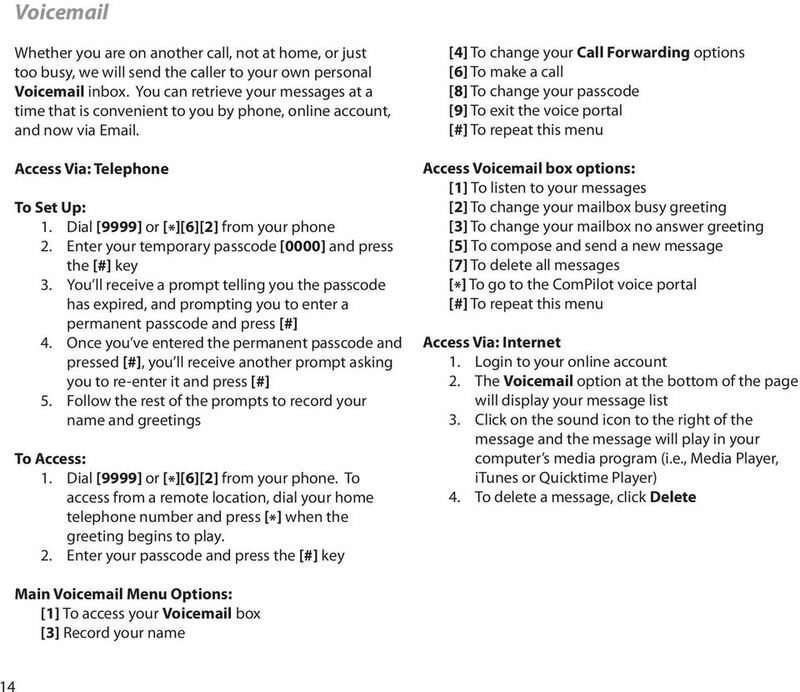 Enter 10 digit telephone number (Area code must be dialed even if call is local). 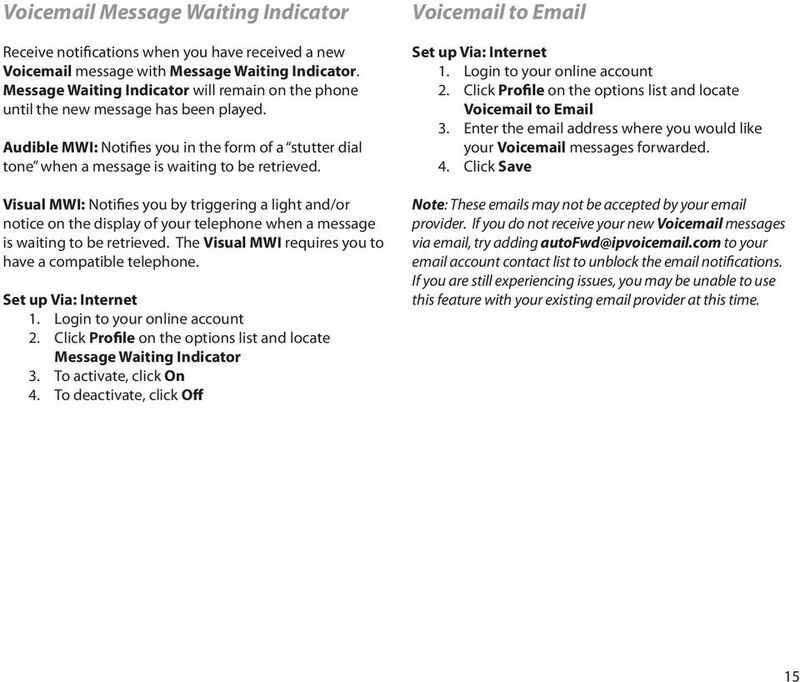 Note: When deactivating Outgoing Caller ID, your number will not be displayed on the recipient s Caller ID. 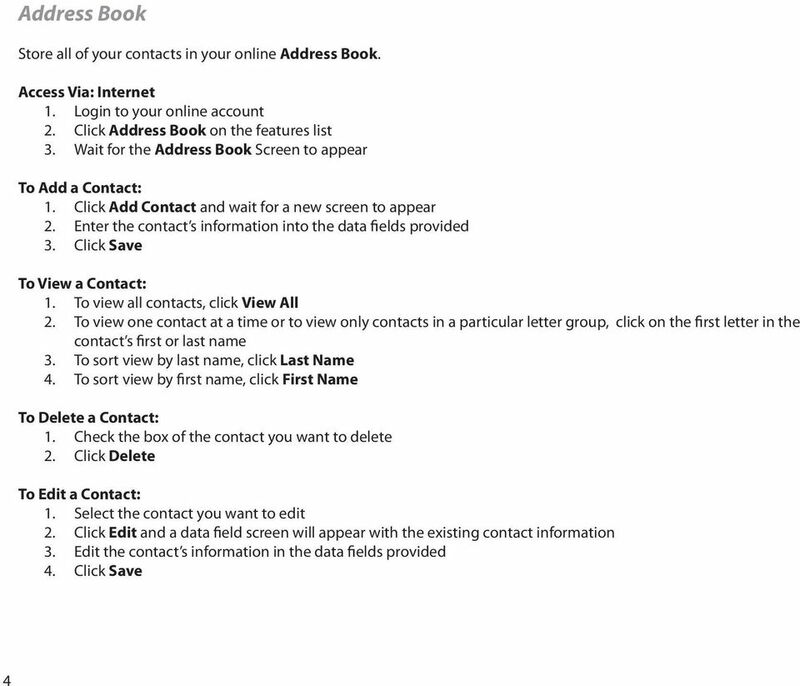 Instead, the recipient s Caller ID will display Private Number. 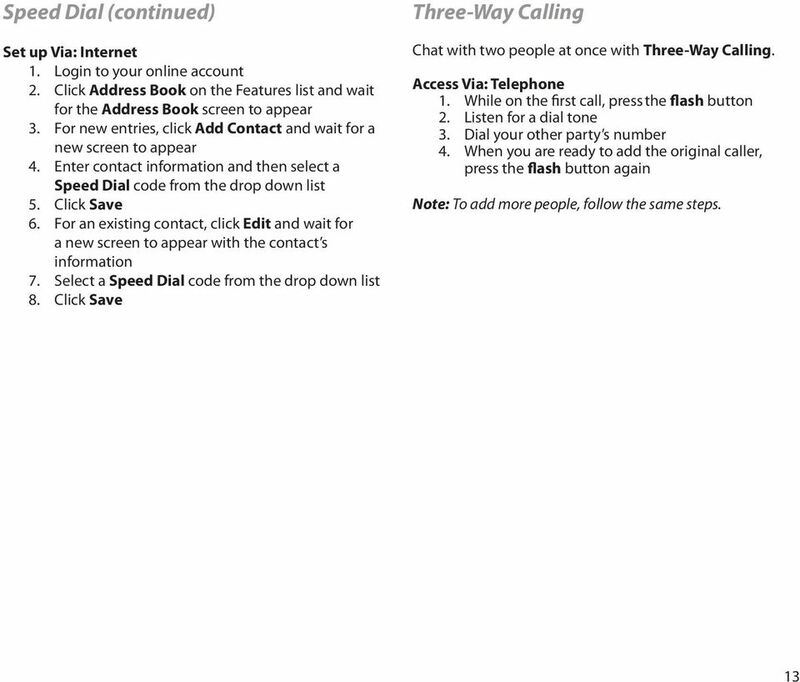 The star code [ * ] will deactivate the Caller ID for one outgoing call only. 16 2009. Information subject to change without notice. Please let us know if you need anything. Our customer service number is 1-866-311-5900. We re always happy to help. We thank you for being our customer, we take pride in providing superior and reliable Commercial Voice services to our customers. 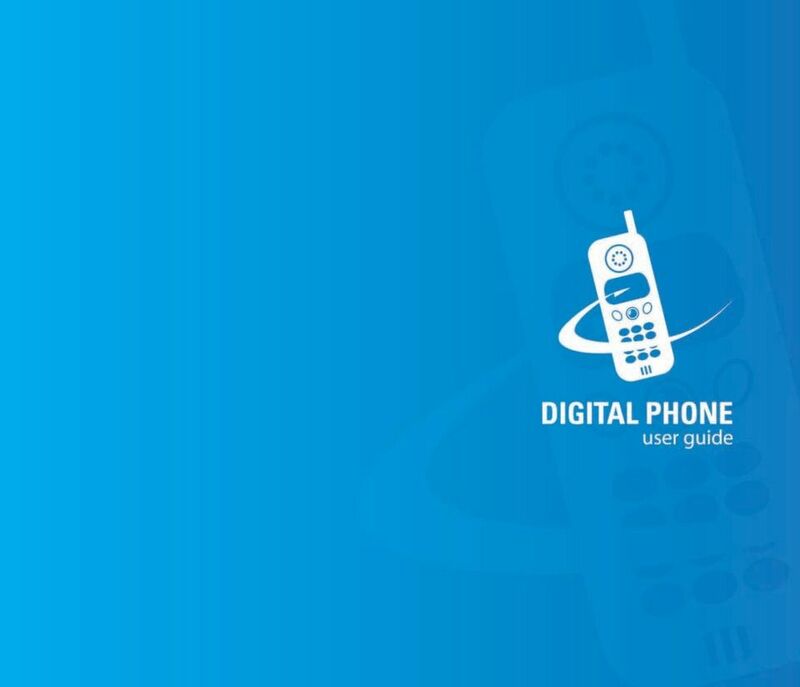 Calling Feature Instructions Digital Phone By Telephone Digital Phone Feature Management By Telephone Instructions This document describes how to manage Digital Phone features using your telephone keypad. 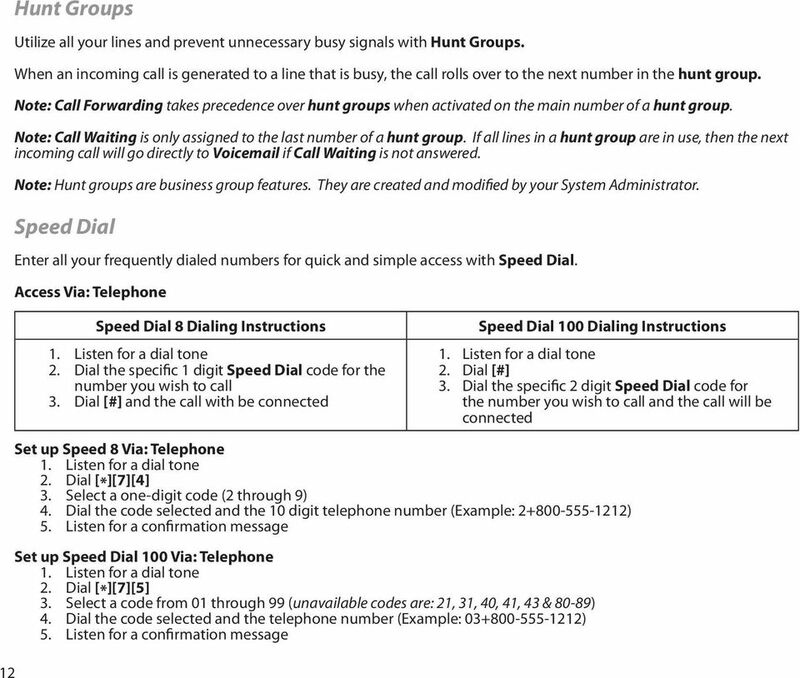 CCI Hosted Voice Services Special Calling Features Quick Reference Guide Feature Access Code Calls NOTE: Feature access codes provided in this guide are examples. 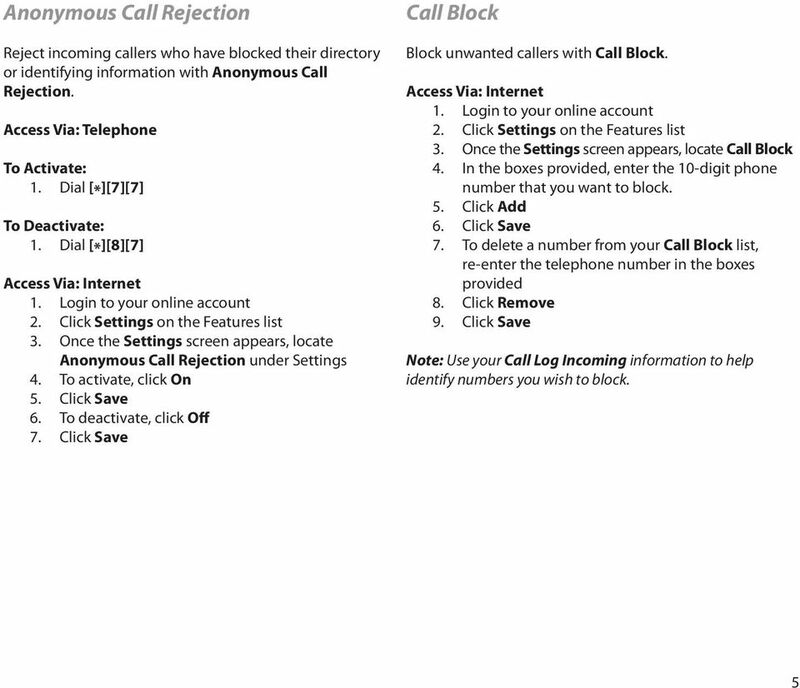 Anonymous Call Rejection Activation 1. Telephone Features can only be used with the following engin products: engin Voice Box and the engin Voice Box Series 2.